My ten year old daughter has been in the cooking mood again. When she heard me say that we were having breakfast for dinner she immediately asked if she could pick the recipe. I am so glad that she is showing an interest in cooking and I am trying to just go with it when she asks to help. I was not in a hurry, so I decided it would be a great night for her to help cook dinner. She spent some time looking through a few kids cookbooks that we have and she choose the Super Creamy Scrambled Eggs from the Southern Living: Kids Cookbook . This is one of her favorite cookbooks. Southern Living did a great job on this book. The directions are easy, yet complete. The pictures are great and the recipes are for food that both kids and parents will enjoy. Whisk together first 3 ingredients in a medium bowl and stir in cream cheese. Melt butter in an 8-inch nonstick skillet over medium heat. Pour in egg mixture. Cook without stirring, until mixture begins to set on bottom. Slowly drag spatula across bottom of pan to form large pieces of cooked egg. Continue cooking until eggs are thickened and firm throughout, but still moist. Salt to taste. 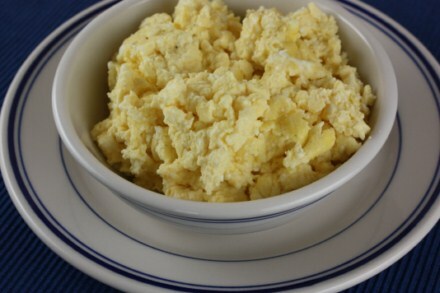 I would never have thought to put cream cheese in my scrambled eggs. @flora, They are a little less healthy, but they really were creamy and really good. My husband loves creamy eggs! I haven’t thought to put in some Dijon mustard in them. That does sound good! Thanks! Like flora, I never thought of putting cream cheese in scrambled eggs! My husband and daughter are going to love this one ! I don’t think I’ve ever tried any of these things in my eggs. I usually keep them pretty simple, so this sounds good. like the sound of the dijon mustard but not sure I could get on board for the cream cheese…then again I’m not really a lover of cream cheese. Here from tidymom, have a good weekend! I’m going to have to look into getting my 10 yr old daughter that cookbook! She loves to cook and experiment in the kitchen, unfortunately sometimes her experiments are a little too science experimenty for most peoples tastes:) LOL! She does good most of the time but definitely could benefit from a little direction! She’s the independent one of the bunch soo for her a cookbook would be ideal, me helping on the other hand doesn’t always go over so well. She’ll be going into 5th grade in few weeks and already has plans as to what college she is going to attend and that she’ll have an apt the day she turns 18!